Don’t tell anyone, but a couple of weeks ago my husband turned 60. 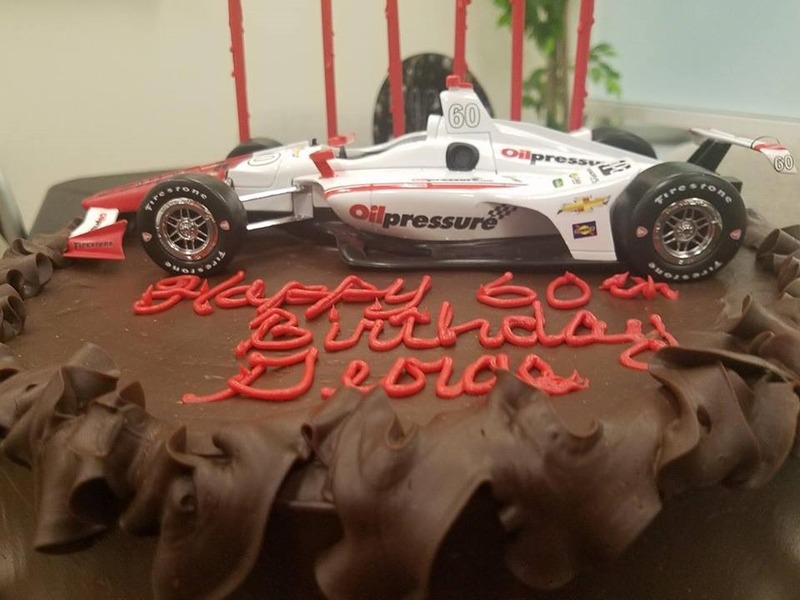 The big 6-0 is a milestone birthday and I knew it had to be special. I had the same milestone right after Indy and he bought me a very nice camera that I had been wanting. 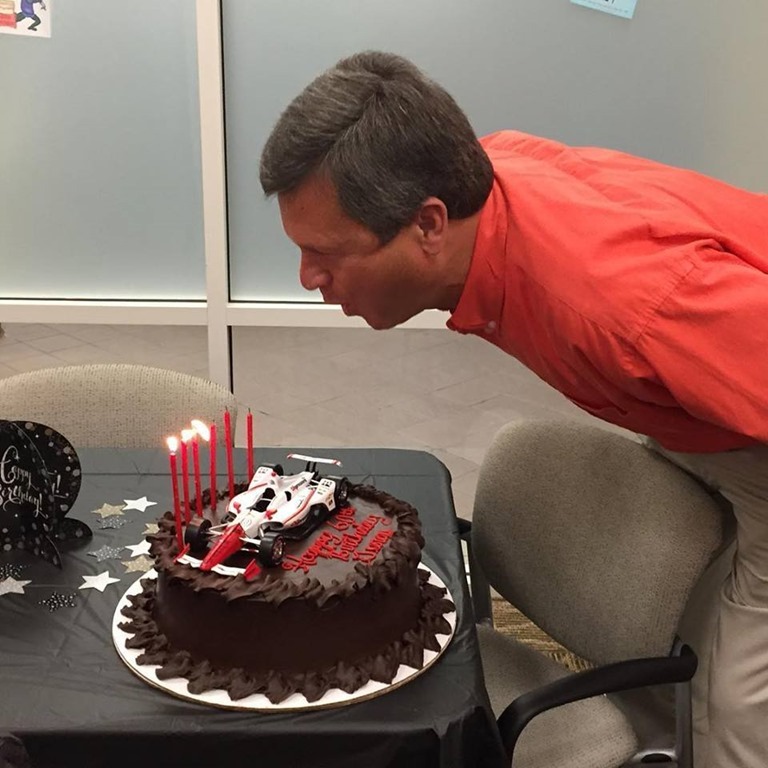 My birthday falls about a week after every Indy 500, so George usually treats it as an afterthought. When he stepped up and did something special for my birthday this year, I knew I’d better do the same. His fiftieth birthday will never be topped. His two brothers chipped in and bought him a ride in the IndyCar one-seater through the Indy Racing Experience. He had three laps at IMS, with him behind the wheel. I rode up with him to Indianapolis that morning and he grinned the whole way back. I knew better than to even try and top that one, but I had a few ideas for something special. George seems to appreciate gifts that are original and take a lot of thought and effort, more than those that just cost a lot of money. I thought about upgrading our seats at Indianapolis, but I couldn’t figure out how to do that without him knowing about it ahead of time. Besides, he doesn’t like change and he might actually prefer our current seats over what I may upgrade to, so I figured I’d better leave that alone. Since I was an art major and my professional background is graphic design; I was wracking my brain on what to do for him. Then it hit me. I remembered seeing blank, solid white die-cast cars at the IMS gift shop. I would create a race car with Oilpressure livery. I enlisted the help of Paul Dalbey and John Oreovicz; Paul because he knows details as well as George does, and John because he builds and paints a lot of race car models and could give me some pointers. I ordered the car from the gift shop, but they first sent me the old style car. Even I can tell the difference and knew it had to be the new car. I scanned the logo from the business cards George takes to races, which also is the same logo he has put on polos, T-shirts, sweatshirts, etc; and ordered decals that would be just the right size for the wings and side pods. Since the Oilpressure colors are red and black that worked perfectly for the next part of my plan. One of George’s favorite paint schemes is the traditional Marlboro livery like Helio had for so many years. I was going to paint the car like a Marlboro car, but have “Oilpressure” where Marlboro would’ve gone. But there was one problem. The tape I used to mask it off pulled the original white off of the car. It left a splotch of bare metal just below the red stripe. I used white paint to cover it up, but the paint didn’t match when it was dried. I was crushed. My plan to match his favorite scheme was now ditched. Ok, on to Plan B.
I ended up painting the entire nose of the car solid red. It wasn’t what I had in mind, but it worked. The decals I ordered didn’t come until just a few days before the birthday. Fortunately they fit, but the pinstripes were wanting to pop off. I figured a clear coat would take care of that, but I was running out of time so the clear coat never made it. Once I get that on there, the nose will be glossy. We all know how much he hates a matte finish race car. Do you know how hard it is to paint and decorate a race car when you travel a lot for work and your husband never travels? I worked on the car in hotel rooms and would come home early while in town and work on it before he got home from work. That last weekend while he was working in the yard, I would simply have to lock the doors and put stuff away while he was banging on the door. George’s birthday fell during the week. 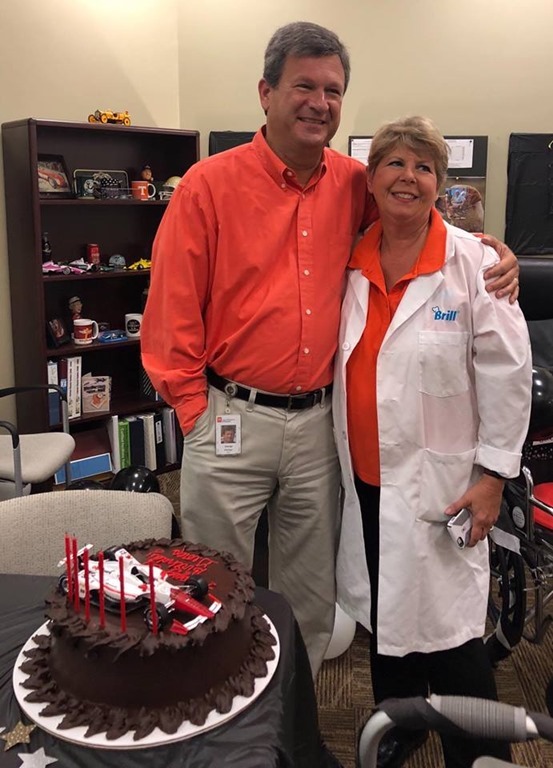 I worked with his staff to make sure he didn’t go anywhere so I could surprise him at work. 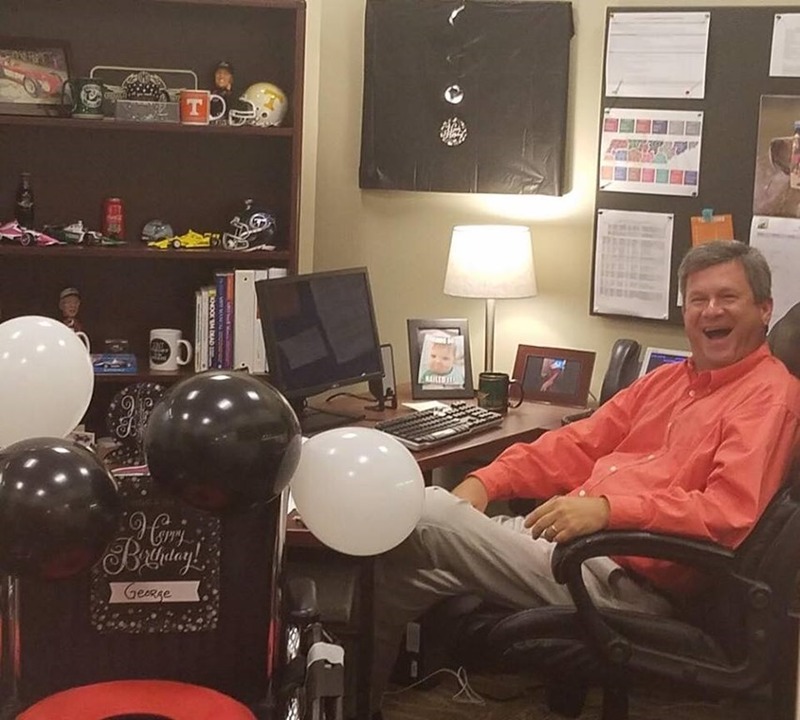 They had already decorated his office, complete with a walker, a wheel chair, black balloons and even covered up his Indy pictures on the wall in black paper. I had gotten him a huge cake from the bakery where I work part time on weekends and I was to be there at noon. Wouldn’t you know it? A friend of his was going to take him to lunch for his birthday. The staff texted me and told me I needed to be there at 11:00 because he was leaving around 11:15. I dropped what I was doing at work, rushed clear across town and snuck into his building. We went to the area just outside his office to light the candles on the cake and set the Oilpressure car on top, but he was on the phone. Darn! Finally, one of his staff went in and told him he needed to get off the phone because there was an emergency. He knew something was up when a few of his staff walked in and started holding their phones in place to take pictures and videos. The look on his face when he saw me carrying a cake with lighted candles was priceless and somebody captured that with a photo. 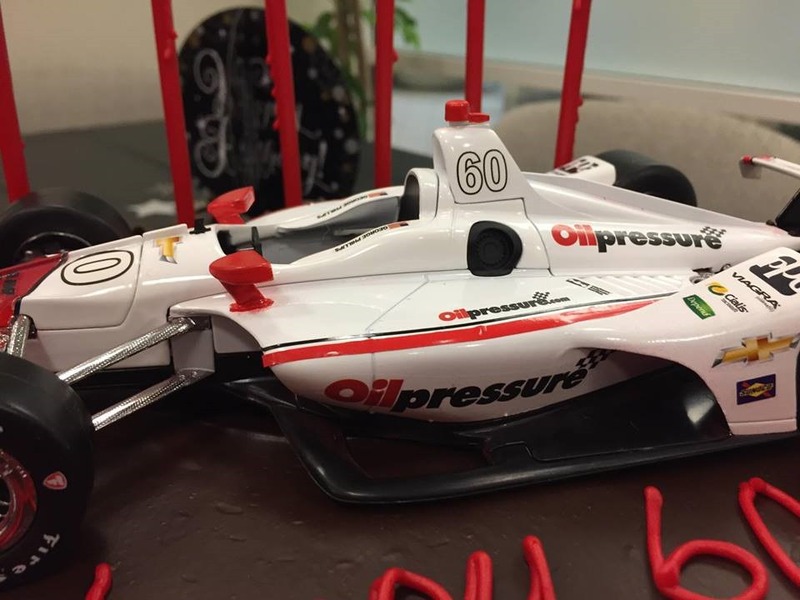 I wish someone had gotten a shot of his look when he saw the Oilpressure livery on his cake-topper. And before anyone asks, it was total coincidence that we were both wearing orange that day. If you look closely, you’ll see that some of the sponsor decals in front of the rear wheel are Viagra, Cialis and Depends. How appropriate for someone turning 60! When he brought it home that night, I gave him the rest of his gifts – all of which had a racing theme. I got him the Scott Dixon video, a white button-down (100% cotton, of course) shirt with the Oilpressure logo, and a black man-purse with the Oilpressure logo embroidered on the side that he can take to races next season, to replace that Titans duffle-bag he uses. Lastly, I got him a clear plastic case to cover and protect the car. 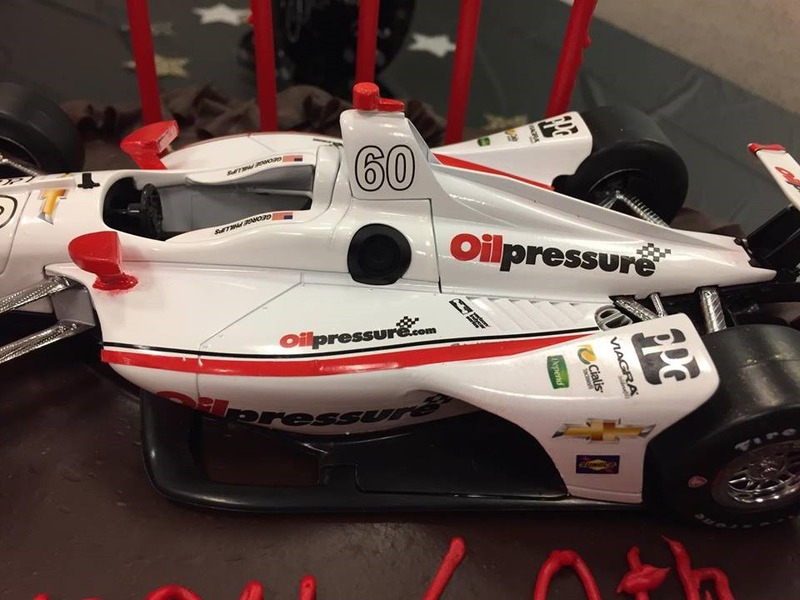 He may not have driven any laps around the Indianapolis Motor Speedway on this milestone birthday, but I think I really struck gold with the Oilpressure car. 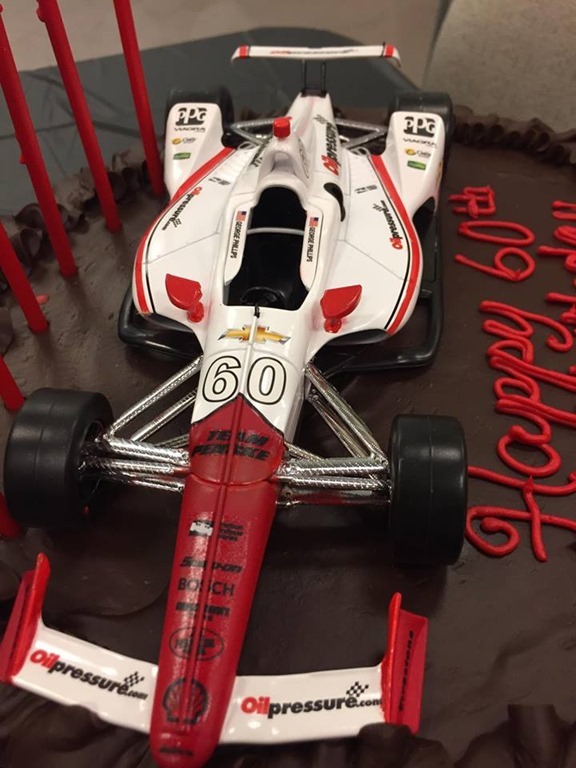 If you are halfway creative and can’t think what to get for your IndyCar fan on their next milestone birthday, try decorating a car. It may be a pain, but the end result is worth it. 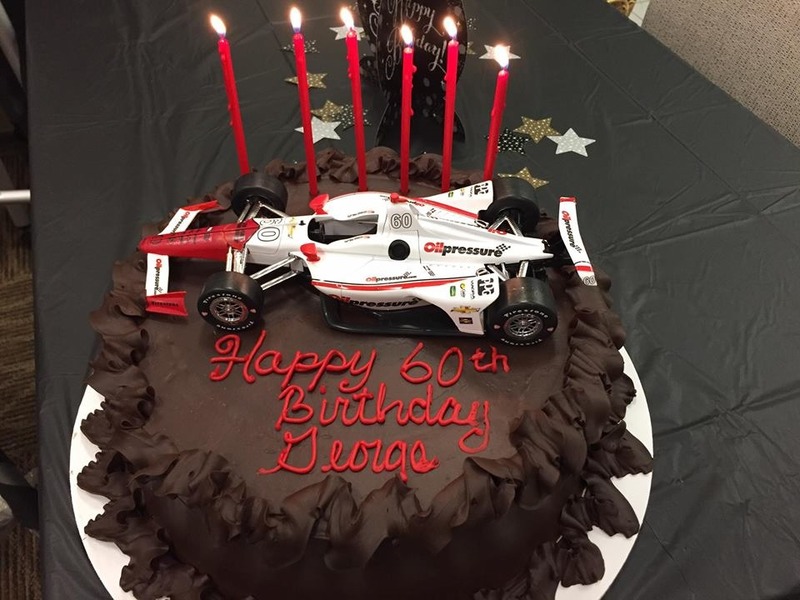 This entry was posted on October 26, 2018 at 4:03 am and is filed under IndyCar. You can follow any responses to this entry through the RSS 2.0 feed. You can leave a response, or trackback from your own site. What a wonderful and creative gift! 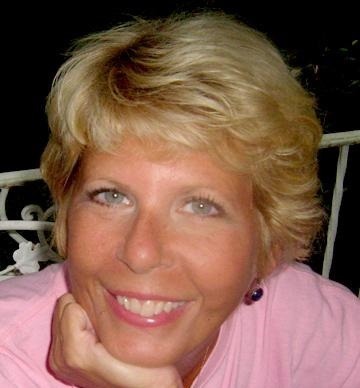 Great job Susan! And happy birthday George! It’s too late to get you a gift so here’s Jim Nabors singing (Back Home Again In) Indiana. nice job Susan, I’m sure he was happy with that car. 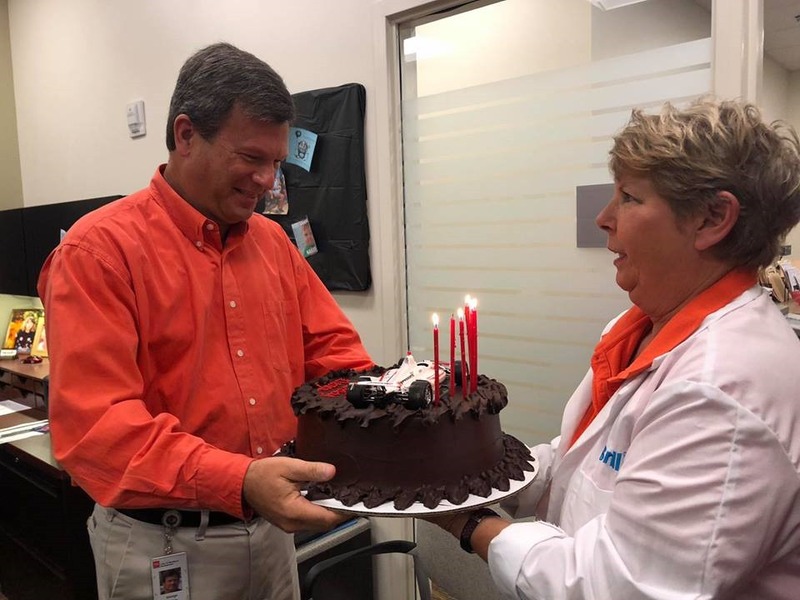 happy belated birthday George, you do a great job with Oilpressure and it’s always a part of my M, W, F morning routine. All I can say is…What a wife! What a wife indeed George! You married up. Absolutely amazing, Susan. George is lucky to have you! Multiple people wearing orange in Tennessee is a coincidence? That car looks great. Excellent work Susan and happy belated birthday George. That was a great gift! You have a very cool wife. Happy birthday, George, I enjoy your work. Hope to bump into you at Indy sometime ,as this coming year will be my 59 500 in row. Brilliant, Susan! Happy belated Bday, George. And 60 is not old at all. Trust me. Susan, the car looks AMAZING! I can see all the hard work you put into it! It’s perfect, just like your cakes! Happy Birthday George, you’ve got a keeper with Susan! Fantastic idea and great execution! 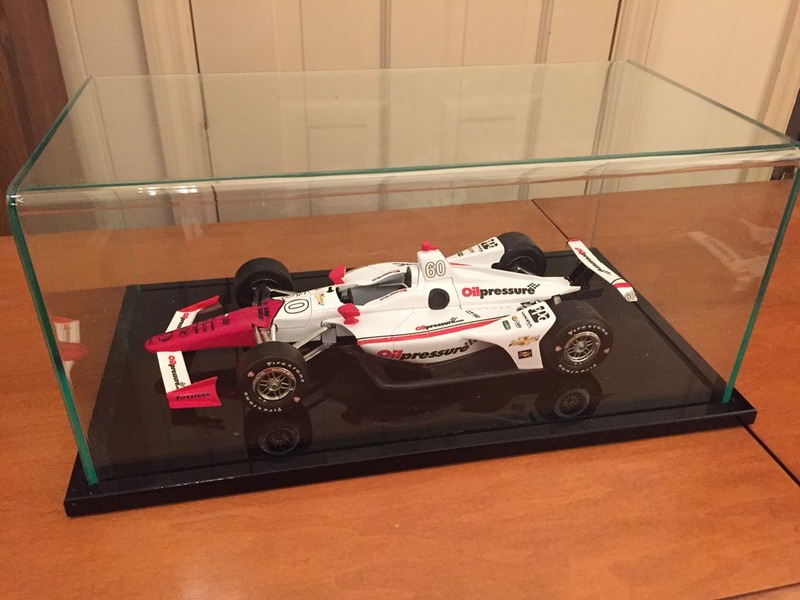 What a perfect gift for an Indycar fan! Kudos Susan!